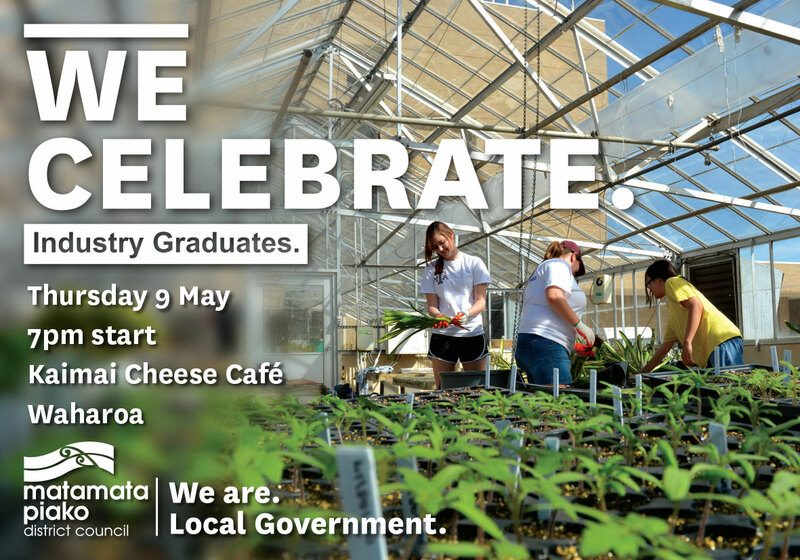 Council acknowledges the success of industry graduates at the Industry Training Graduation, this years event is to be held at Kaimai Cheese Cafe, Waharoa, 7pm, Thursday 9 May. Matamata-Piako District Council is a member of the Mayors Taskforce for Jobs, a national initiative to encourage employment or training for people in New Zealand. The Mayors Taskforce for Jobs Industry Training Graduation is held annually to recognise the importance of industry training qualifications and to celebrate the success of those who have chosen to become skilled in their profession. Join us for a relaxed evening where we celebrate our graduates being presented with a certificate in recognition of their achievement. The next Industry Training Graduation will take place 9 May 2019. You and one other person of your choice can attend for free, and additional attendees cost $10 each. Payment can be made for additional attendees online by credit card (processing fee applies) or over the counter at your local council office (please provide their names as they will then be added to the door list).